A New Feature available in Joomla 1.7 can be found in the Menu Manager when creating a new Menu Item. When you create a Menu item – “List Search Results’, a required field is now the “Search Term”. In the screenshot example below, I put ‘Project”. 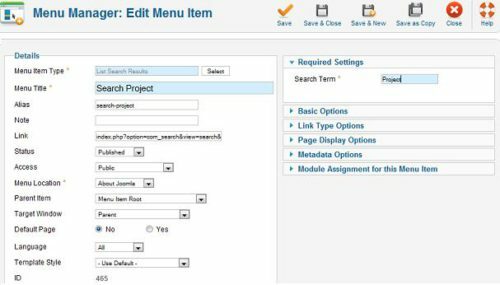 So then when you click on this link in the menu navigation, the link will return all search results with the word “Project” in your Joomla 1.7 website. Nice feature. Can I create a link without search term? I mean simply open the search page.